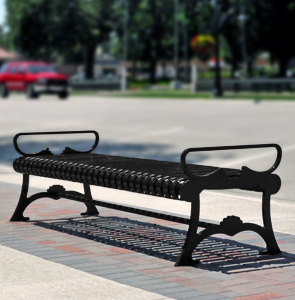 This classic Lemars Series outdoor backless bench looks perfect along the sidewalks allowing users to sit facing either direction. Solid heavy-duty 1" thick steel plate legs and 1-1/2" wide steel ribs. This bench is portable, but can be mounted to a flat surface by using the .5" Dia. pre-drilled mounting holes. Ships fully assembled.